There was a recent news brief stating that the average internist generates about $2.4 million annually for the hospitals that they work for. While it’s no surprise that doctors help others make money, seeing a figure to your worth hammers home how much we sustain the health care system, often at our own expense. A $10,000 annual bonus for twelve consecutive months of good patient satisfaction scores. A $5,000 quarterly bonus for handling more admissions from the ER. An invitation-only steak dinner catered by the hospital for a year of prompt charting. Now, this article is not intended to get all doctors to strike, but we do have to sit back and realize that we’re getting moldy carrots for a whole lot of work. In case you were wondering, those fat cats occupying the C-suite are getting steak dinners more than once a year. 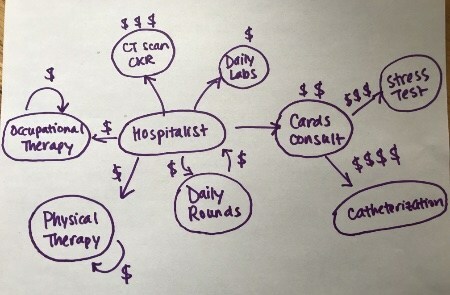 How does a hospitalist bring in $2.4 million to the hospital? This is more of a thought exercise, but I’ve had colleagues tell me that their RVUs amount to a fraction of this $2.4 million figure. Sometimes, hospitals show doctors their RVUs to shame them into working harder — maybe comparing them to each other or showing that a particular doctor isn’t meeting the baseline number of admissions. Not all RVUs are created equal, but that will be a discussion in another article. Even though the primary doctor only brings in direct revenue from daily exams, labs, and diagnostics, all of the consultants downstream generate even more money for the hospital. Remember that revenue comes both in the form of professional and technical charges. The technical and facilities charges bring in serious amounts of money into the system. Just look at some of the bigger hospitals in metropolitan areas — they are all renovating their facades and public spaces to attract more patients. The money is coming in somewhere, and doctors play an integral role in capturing that revenue for the hospital. Unfortunately understanding the money trail isn’t going to get your hospital to pay you more. The issue has to do with numbers. Just as hospitals are trying to supplant MDs with physician extenders who can follow protocols at a lower salary, the more doctors of your “type” there are, the easier it is for the hospital to hire. In the medicine world, internists are a dime a dozen — you can always be replaceable if there is someone out there willing to do your job for less pay. More specialized doctors may have more leverage in the health system; they are still replaceable. I’ve seen highly trained specialists in metropolitan areas become replaced by hospitals when they gripe about work hours or inadequate salaries. The more work for less pay issue doesn’t sit well with me; we all obviously have different thresholds on our worth, but the lack of uniformity among our profession contributes to our downfall. I’d imagine that starting debt after our training contributes to our willingness to negotiate higher salaries, as does our starting net worth. Until we find a more unified front to combat the system, I continue to tell my trainees to learn as much about the health care system as they can if they intend to practice medicine. “Smart Money, MD” is an ophthalmologist who blogs at the self-titled site, Smart Money MD. Is debt-free medical school a financial blunder for doctors?